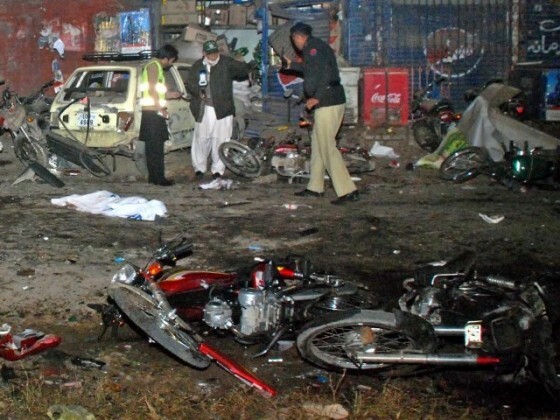 JNN 11 Jan 2015 RAWALPINDI: A powerful blast rattled an Imambargah in a densely populated Shia Majority area of Rawalpindi on Friday, killing at least eight people and injuring at least 16 others. Media Reports that the blast took place outside Imambargah Aun Mohammad Rizvi in Chatian Hatian area of Rawalpindi, also damaging the building. An Eid Miladun Nabi (PBUH) congregation was being observed at the imambargah at the time of the blast. Police officer Raja Abdul Rasheed told AP that the explosion targeted the mosque affiliated with Shia Muslims. Rasheed said the explosion also wounded 16 people. He said authorities believe the bomber tried to Force his way into the Imambargah. But he was challenged by the Young Shia Security Volunteers at the entrance, and as he felt entrapped, he blew himself up outside. Eyewitnesses said the explosion was very powerful and blew out adjacent Building windows, and also damaged the Imambargah Building. At first four bodies were brought to the District Headquarters Hospital (DHQ), where emergency was imposed, hospital sources told. Several people were also injured in the explosion, with rescue workers saying the number of casualties was expected to rise. Two policemen, who were posted on security duty outside the Imambargah, were also among the injured. Even to someone who has lived in Chittian Hattian all their life, the neighbourhood was unrecognisable on Saturday morning. The hazy day seemed to reflect the gloomy mood of the area and from the confines of the houses packed next to each other, the sounds of silent sobbing betrayed the tragedy of what had befallen this quiet neighbourhood the night before. Friday’s deadly attack claimed the lives of two members of the same family, and deprived the community of four of its best sons and community activists. Haider Kazmi, the father of a one-year-old son and a four-year-old daughter, was a regional manager at a local private bank. He was also the nephew of Ibne Rizvi – who is the central leader of PPP dissident group led by Naheed Khan. Haider had come to his grandfather’s house for the Milad ceremony, but ended up saving many other lives when he intercepted a suspicious looking man on a motorcycle moments before the explosion ripped through the congregation. “Haider was known for finishing his work early. Now that he’s gone, we realise that he was always in a hurry,” said Ibne Rizvi, with his eyes bloodshot and tears streaming down his cheeks. “We already lost so many people in these attacks; four new martyrs have been added to the list. Police are investigating but we don’t know whether the killers and conspirators will ever be arrested or not,” he said. The family also lost another son in Ali Mehdi Zaidi. Ali and Haider were cousins, and Ali also had a one-year-old son. Ali’s father was also among those wounded in the attack, and is currently said to be in critical condition at the Benazir Bhutto Hospital. Qasim Shah, the custodian of the Imambargah Master Jabbar, located two streets down from Imambargah Abu Muhammad Rizvia, also perished in Friday’s bombing. He was attending the Milad as per family tradition. Javed Zaidi was the most prominent social worker of his community. Known and loved by all in the neighbourhood, he ran a private supply firm. “He was always ready to help the poor and his neighbours. He was a thorough gentleman and a dedicated social worker,” said Shujaat Haider Naqvi, one of Javed Zaidi’s neighbours. “People would always invite Javed to their functions and he helped everyone without caring for their caste, sect or creed,” said Attiqueur Rehman, a shopkeeper from the street where Javed lived. A bomb targeting Shias at a volleyball match killed at least five people and injured 10 in Pakistan’s restive northwest last Sunday. Strongly condemning the terrorist attack, Allama Abbas Kumaili ( JAP ) , Declared that the Present Government has completely failed in Protecting the Lives of the Pakistanis across the Board, He added that an all out Army Operation across Pakistan is the need of the Hour, with Military Courts Quick Dispensation of Justice , which has strength to Penalize the Convicts ,without any Discrimination of Cast , Creed or Color . Condemning the incident, MWM chief Allama Raja Nasir said that Shia Muslims are being killed across the country and the state’s writ is being challenged by the terrorists, but the rulers are not willing to address the issue of extremism. He urged the military leadership to expand the scope of ongoing military offensives in the tribal areas bordering Afghanistan. Security has been put on a high alert in Rawalpindi and Islamabad following the attack at the imambargah. Speaking to DawnNews, Awami Muslim League (AML) chief Sheikh Rashid Ahmed condemned the incident, urging the masses to form neighbourhood committees to oversee suspicious activities. Criticising the government, he said law enforcement forces have failed to protect lives and properties of common citizens. According to Interior Minister Chaudhry Nisar Ali Khan, he said, every tenth madrassa is being used to promote terrorism and hatred against religious minorities. Nasir said today’s attack indicates that terrorists are present everywhere in the country. This entry was posted in Asia Pacific, Pakistan News and tagged Eid Miladun Nabi, Imambargah, Imambargah Abu Muhammad Rizvia, Imambargah Aun Mohammad Rizvi, Milad un Nabi, Raja Abdul Rasheed, shia community, Shia Muslims. Bookmark the permalink.